This Sunday is the Feast of the Epiphany of the Lord. Today's readings emphasize the universal nature of God's invitation to fellowship and union with him. Not just exclusively for the Jews, but for all the nations, even the Gentiles. Our Gospel reading (Matthew 2:1-12) is the story of the three wise men from the east coming to bring gifts and praises to the newborn King. These three kings represent the non-Jewish foreign world also recognizing and paying homage to the One God made flesh. 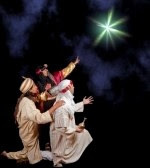 ". . . . Then Herod called the magi secretly and ascertained from them the time of the star's appearance. He sent them to Bethlehem and said, "Go and search diligently for the child. When you have found him, bring me word, that I too may go and do him homage." After their audience with the king they set out. And behold, the star that they had seen at its rising preceded them, until it came and stopped over the place where the child was. They were overjoyed at seeing the star, and on entering the house they saw the child with Mary his mother. They prostrated themselves and did him homage. Then they opened their treasures and offered him gifts of gold, frankincense, and myrrh. And having been warned in a dream not to return to Herod, they departed for their country by another way." Our first reading (Isaiah 60:1-6) also emphasizes the role of foreign cultures in recognizing the glory of Jerusalem on the day of fulfillment. "Rise up in splendor, Jerusalem! Your light has come, the glory of the Lord shines upon you. See, darkness covers the earth, and thick clouds cover the peoples; but upon you the LORD shines, and over you appears his glory. . . . . Then you shall be radiant at what you see, your heart shall throb and overflow, for the riches of the sea shall be emptied out before you, the wealth of nations shall be brought to you. Caravans of camels shall fill you, dromedaries from Midian and Ephah; all from Sheba shall come bearing gold and frankincense, and proclaiming the praises of the LORD." In our Epistle reading (Ephesians 3:2-5, 5-6), Saint Paul explains that, through the revelation of God, he proclaims that the Gentiles are coheirs to the Kingdom. "You have heard of the stewardship of God's grace that was given to me for your benefit, namely, that the mystery was made known to me by revelation. It was not made known to people in other generations as it has now been revealed to his holy apostles and prophets by the Spirit: that the Gentiles are coheirs, members of the same body, and coopartners in the promise in Christ Jesus through the gospel." It is good, on occasion, to reflect on the universal call of the Church and to realize that God's invitation to others often can only come through us. May we have the grace and the fortitude to defend our faith and invite others into it.